This recipe for Serbian spinach pie or pita zeljanica is similar to a savory strudel or Serbian burek made with flaky filo dough. Zeljanica falls into the category of layered dishes sometimes called, which can be made sweet or savory, or salty, as they are known in Serbia. Zeljanica makes a great appetizer, snack, brunch, side dish, or main course, especially for vegetarians. Because the recipe contains dairy and eggs, it isn't suitable for vegans. This can be compared to Greek spinach pie or spanakopita. Heat oven to 350 F. Squeeze spinach dry. In a large bowl, thoroughly combine spinach, 1 pound grated brick cheese, 1 pound undrained large-curd creamed cottage cheese, 3 tablespoons sour cream, 1/2 cup milk, 6 large beaten eggs, 1/2 cup all-purpose flour and 1/2 cup yellow cornmeal, and set aside. Lightly brush a 13x9-inch pan with melted butter. Lay down 1 sheet of thawed filo dough, and lightly brush it with butter. Continue with 3 more sheets of buttered filo so you have a base of 4 sheets of buttered filo dough. Spread filling evenly over filo base. Lay down 1 sheet of filo dough, and lightly brush it with butter. Continue with 3 more sheets of buttered filo so you have a top of 4 sheets of buttered filo dough, the same as for the base. Brush liberally with remaining butter, trimming excess edges of filo dough or turning them in toward the center. Bake 45 minutes, more or less, or until the top is golden and the filling is set (test with a thin knife). 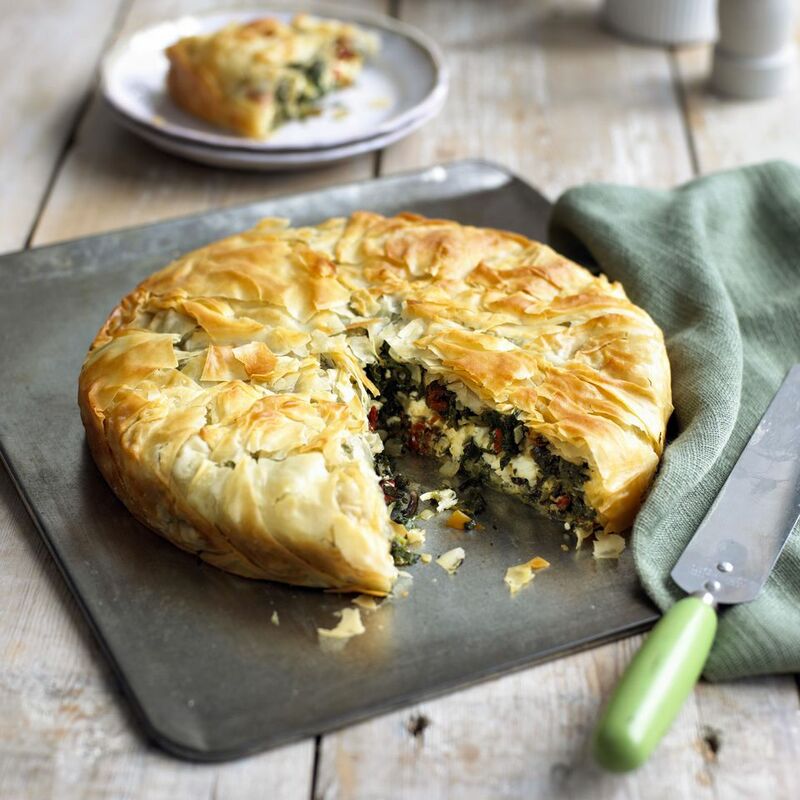 Let cool, cut into squares and serve the Serbian Spinach Pie or Zeljanica warm or cold with a cold glass of kefir.